Joshua Rozenberg asks if the police's use of cameras endangers civil liberties or is necessary to prevent crime. More than two decades after he first presented Law in Action, Joshua Rozenberg returns to the programme to investigate the issues which influence and determine our law. In this opening programme, he examines an issue that looks set to prompt widespread debate among the public as well as among those working in the criminal justice system. 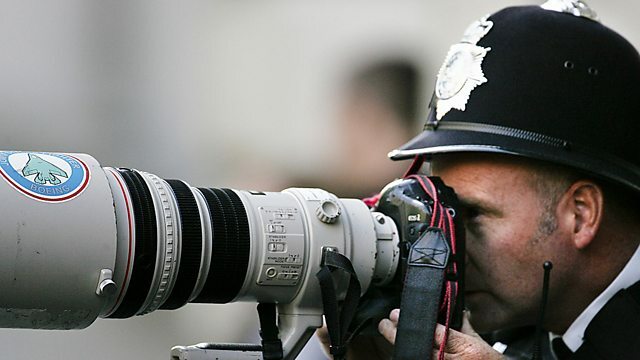 Increasingly the police are using digital cameras and intelligence tactics to create image libraries of campaigners and protesters. These are designed, senior officers say, to help the police prevent criminal acts from being committed. But critics see the creation and development of the photographic databases as potentially sinister, claiming that ever larger numbers of images are being added. Joshua Rozenberg investigates how the police, the courts and those responsible for protecting personal data strike a balance between the need to safeguard civil liberties and the police's responsibility to prevent crime. Are there enough safeguards to protect the public from being unfairly linked with criminals? Is maintaining public order being used as an excuse to engineer a surveillance society? Or are the authorities simply taking the minimum steps to ensure a determined and well-organised minority of protesters bent on disruption do not wreck the lives of the law-abiding majority?